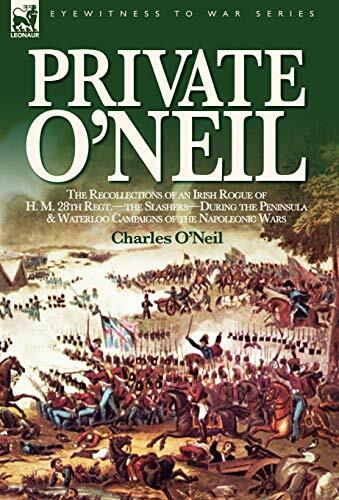 Private O'Neil: the Recollections of an Irish Rogue of H. M. 28th Regt.-the Slashers-During the Peninsula &amp; Waterloo Campaigns of the Napoleonic Wars At war with 'the Slashers'-the fighting 28th O'Neil wrote his military memoirs from his American home, having moved there from Canada because he &quot;did not feel safe&quot; after quitting Ireland out of necessity. As a recruit he took his enlistment bounty four times - absconding to re-enlist on three occasions. This then is the story of a rogue (sanitized by him) who went to war against Napoleon's French. Whilst O'Neil may not have been reliable, like most of his breed he is entertaining. His accounts of war in the Peninsula are graphic and realistic. Present at the storming of Badajoz his description of the scene carries the reader to the heart of the action as well as any other account - and better than most. At Waterloo O'Neil was wounded and his account of the famous battle is equally compelling. This is a fine Napoleonic memoir from an ordinary soldier's viewpoint.